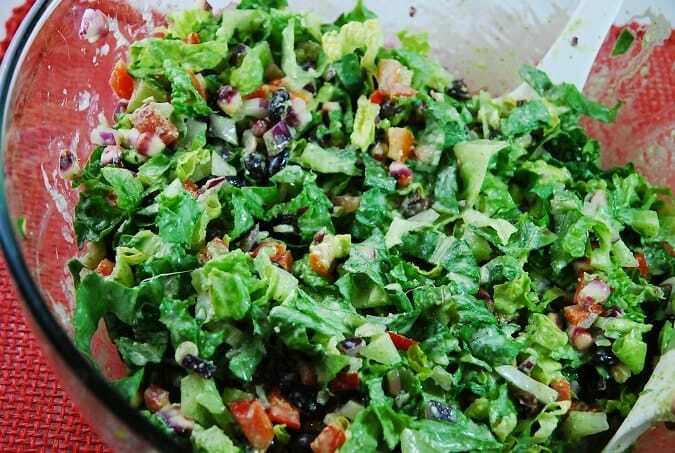 This easy and delicious Southwestern Salad with Creamy Cilantro Dressing is a vegetarian salad that packs a powerful dose of fiber and protein. It’s a filling and incredibly flavorful salad that is topped with fresh, creamy, homemade cilantro dressing. Inspired by my favorite salad from Stonefire Grill, this is perfect as a main course for a lunch, or cut each serving in half for a dinner side dish. It’s also one of my favorite salads to take to a BBQ or potluck – everyone loves it. You can use canned or frozen corn with this if it’s easier, but I personally LOVE the taste grilled or roasted corn on the cob, that is sliced to remove the kernels. It adds a tremendous flavor boost. This most recent time I made it, I used an ear of red corn (as you can see in the photo) that I came across at a Farmer’s Market and thought it’d be fun to try. It was delicious! But a regular ear of yellow corn works just fine. For some added crunch and flavor, top with some crumbled low fat tortilla chips. The creamy cilantro dressing is really versatile and also goes great as a sauce over chicken or a dip for veggies and pita chips! Tangy and flavorful, the creamy cilantro dressing is the star of this salad. It enhances the fresh ingredients of the salad ever so perfectly while adding a wonderfully bold flavor. Great for a summer potluck recipe or BBQ side dish. Make dressing first by placing the last 6 ingredients in a blender. Puree until smooth and set aside. In a large bowl toss together the first 6 ingredients. Pour dressing over top and toss well to combine.